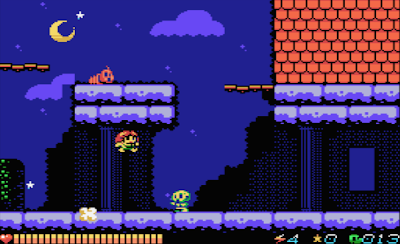 A chilly palette of nocturnal blues and blacks sets the scene visually at the outset of the game, following a neat intro that recounts the story so far, and can conveniently be fast-forwarded through. The zombies (and not just human zombies; birds, spiders and what are either snakes or caterpillars with spines are also present in zombified form) are cutely realised in bold colours, and crumble down to cartoony skeletons before finally being put to rest by our heroine's good old fashioned platformer jump-on-the-head attack. 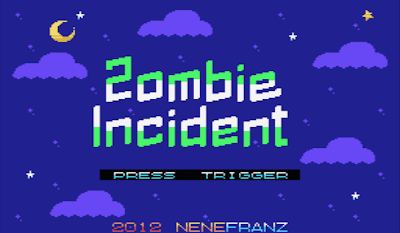 Zombie Incident is a deeper game than a cursory glance at a screenshot would suggest. 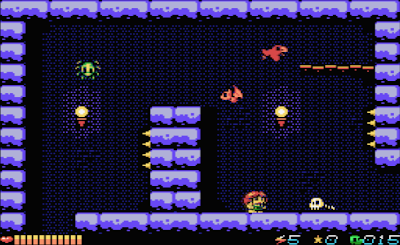 For example, flying against 8-bit platformer conventions, each screen's bad guys remain dead once killed, which is a neat trick and certainly not what I'd expected. Pressing F5 brings up a map, which is inarguably a luxury in 8-bit platform games, and a large energy bar with many small increments takes away the three strikes and out gameplay that goes hand in hand with platformers. 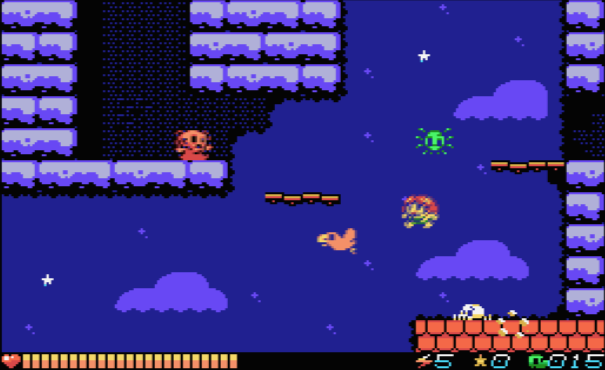 It's a lot of fun as well, of course, and the wall-jumping function especially adds a lot to the game, making for acrobatic leaps over (and onto) the heads of the bad guys. There's a nice sense of progression as the blue shades of the citadel give way to the earthtones of the upper caverns, and the browns in turn give way to exotic purples and gloriously loud greens of the lower levels of the caves, while John Hassink's spooky score rattles along happily in the background, gelling well with the gameplay and becoming more urgent when the character's life bar is dangerously low. Unkillable enemies are thrown in to make things a bit tougher, and the limited range of enemy types doesn't really bring the game down, as the system of varying toughness based on sprite colour adds extra diversity. The game's ease of play may be a deal breaker for some players, it's a game purpose-built to be quite forgiving, with the aforementioned extra big health bar, and it even gifts the player with an increase to the character's health when she eradicates all the zombies in any given screen. Even the pools of what I assume is acid aren't instant killers, and in all honesty the game does lack any real heart-in-mouth moments of tension. In spite of its ease of play, and a few other minor flaws (although it appears that all the bugs of the previous build were fixed with this latest release) Zombie Incident is a skilfully put together game with a fair amount of replay value, enjoyable casual gameplay and endearing graphics that wears its personality on its sleeve. Download the game here (from the MSXdev website).